Nextiva is routinely one of our top choices when it comes to not only Business VoIP, but also CRM, analytics, and call center markets. This flexible provider seems to be able to juggle many different hats, and expand their industry leading portfolio even further. The same can absolutely be said for Nextiva’s Live Chat Software offering. 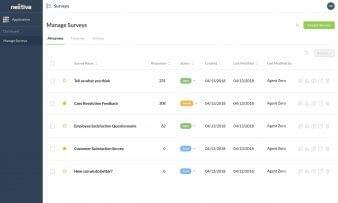 The platform enables your business to provide customers with faster service by boosting overall efficiency throughout your contact center or sales team. Live Chat enables your business to provide users with the service they want – real-time, personal interactions with representatives. With Nextiva’s Live Chat software, your business can embed the functionality directly into your website for them to access when they request help. But, Nextiva’s platform also makes it possible for your business to offer help proactively, and reach out to customers when they might need support the most. These chats can trigger on specific pages, or after specific actions like if a visitor has been on one page past a certain time limit. Managers can set different availability options as well, offering live chat at different hours, and providing offline forms for visitors to fill out to then be contact once a representative is back online. 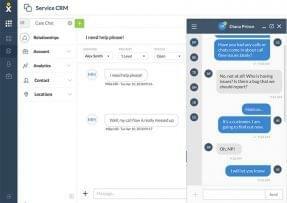 Nextiva’s Live Chat software also provides your business with an internal chat enabling agents to collaborate on different customer cases and increase efficiency overall. An unlimited chat history also helps provide context, along with chat transcripts, real-time website monitoring, and even agent performance monitoring. Overall, just like with their other solutions, Nextiva provides your business with a complete platform to revolutionize the service you can provide. Nextiva offers some of the most compelling services and solutions at some of the best price points for the industry, all while maintaining a robust, carrier grade network with redundant data centers scattered around the country. Nextiva’s strongest strengths lie within their absolute complete package, providing organizations with an advanced platform that combines multiple solutions into one application, known as NextOS. NextOS enables your business to access every single data point and every single interaction point from the same app, allowing users to manage all systems under one roof. Live Chat can of course be purchased along side Nextiva’s other products, or as a stand alone solution. What Do You Think of Nextiva Chat?